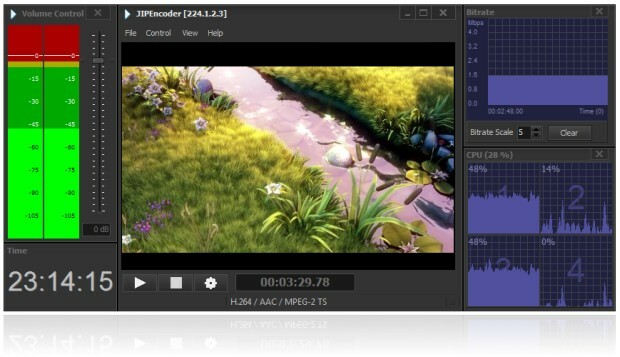 JPlayout is a powerful SD, HD and 3D multi-screen playout solution. The playout solution allows broadcasters to deliver their branded content to any device – TV sets, desktops, laptops, tablets and smartphones. It supports different digital media formats, compressions, resolutions and frame rates mixed into a single playlist. The playout performs real-time video rescaling, video frame rate conversion and audio re-sampling to provide an unified output format. The multi-screen playout solution supports trimming source file with cue-in and cue-out media points. Logo insertion is provided for easy TV channel branding. Built-in Gaphics overlay as well as IP Encoder and Streaming – for more details read the corresponding sections below. Some of the supported formats are MPEG-2, MXF, MP4, AVI, HEVC/H.265, AVC/H.264, DV CPRO 25/50/100, MPEG-4, JPEG 2000, AAC, MPEG Audio, XDCAM, HDV, QuickTime and more. JPlayout is an easy-to-integrate multi-screen playout solution for OTT and TVE broadcasters, TV channels, satellite centers, webcasting and pay-per-view TV channels. It supports the full range of BlackMagic Design playout cards. The playout provides the ability to output through SD SDI, HD SDI, HDMI, NDI, Composite, Component, IP, UDP, RTP, HLS (HTTP Live Streaming) and MPEG-DASH (Dynamic Adaptive Streaming over HTTP). JIPEncoder is built-in in the playout solution. This enables the JPlayout to encode and stream via UDP, RTP live streaming, NDI, HLS – HTTP Live Streaming and MPEG-DASH – Dynamic Adaptive Streaming over HTTP. The JIPEncoder takes the JPlayout output, performs video and audio compression, multiplexes in MPEG Transport Stream or fragmented MP4 and streams it out via selected network interface and IP protocol. The IP streaming process can be controled separately from the main playout in manual mode. The streaming process can be also automated through the JIPEncoder scheduler automation module. The separation of the IP streaming process from the main playout solution enables simultaneous SDI and IP output. Supported graphics elements are Text, Image, Image Sequence, Crawl and Roll. Font, color, outline, transparency can be controled for each element. 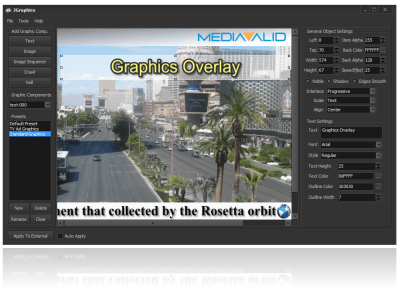 Live graphics editing mode is available. Video pass-through with graphical overlay mode is supported. JGraphics is also integrated in JCapture and JIPEncoder solutions, as well as provided as a stand alone solution.